Billboard recalls the days of wood type and the many fairground posters hand-printed by village craftsmen printers. Great for a vintage or summer fair styled wedding. Available in many colourways. 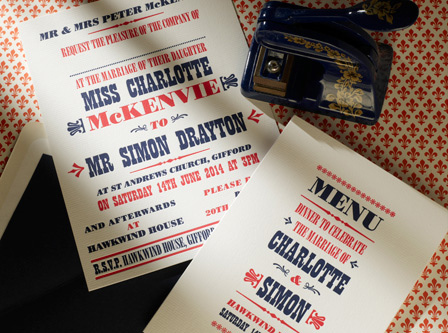 The standard wedding invitation is pPrinted in letterpress deep blue and terra red ink on 8″ x 6″ High White Laid heavy weight single card, supplied with matching envelopes (unlined). The invitation can be adapted to your preferred style and you have the option to alter: size, ink colour, print style and font, card type, gilt edging, lined envelopes, add motif, ribbons or artwork to the design.